Subjects, styles, advertising, other relevant information: In the 1881 census Harry Warren Wicks, then aged just 14 was a clerk to an architect and was living with his parents at 4 Bradwells Yard Cambridge. His father, Henry Wicks b: 1840 Cambridge, was a bookbinder; his mother, Sarah b: 1837 Cambridge, was a college bedmaker. In the 4th quarter of 1888 Harry married Annie Elizabeth Raven b: 1863 Chesterton, Cambridge. In 1891 Harry was listed as a photographer, an employee, living at 52 Herbert Street, Cambridge with his wife Annie Elizabeth and son Harry Raven Wicks, b: 1890 Chesterton; also present Elizabeth Bain b: 1871, Peterborough a visitor. We do not at this stage know who employed Harry in Cambridge, but he had family connections with two organisations using photographers: his brother, Thomas Frederick Wicks, was employed by the Cambridge Daily News from 1888 until his death as their chief cashier in 1933 and his father, Henry Wicks, was reported as a long term employee at the Cambridge University Library when he died in 1913. By 1901 Harry and his family had moved to Oxford and were living at 62 Kingston Road. Harry was listed by the enumerator as Henry W Wicks. Also present were his wife Annie, Son Harry Raven and additional children Reginald Hugh, b: 1897 Cambridge and Gordon R b: 1900 Oxford . Also present were two visitors, William J Delph, fruiterer, employer b: Canada and his wife, Ellen b: Norwich, plus a male boarder. Harry's occupation was listed as a process photographer. In 1911 the family was living at St Just Villa, Warwick Road, West Drayton Middlesex. Unfortunately son Gordon had died in 1908. Sons Harry and Reginald were still living with their parents. Harry was shown as a photographic chemist and Harry Jnr was a photographic operator, both were employed by the Rotary Photographic Co. The Rotary Photographic Co, established 1901, had its HQ at Mortimer House, Mortimer Street, London, W1 and its works at West Drayton, Middlesex. It was a huge publisher of real photo postcards. In 1921 Amalgamated Photographic Manufacturers Ltd was formed (as APM 1921) and brought together seven British companies: these included Rotary Photographic Co and Marion and Co - whose name appears many times on this site as the manufacturers of mounts for cartes de visite. In 1928 A new organisation was formed, called APeM (Amalgamated Photographic Equipment Manufacturers ), again including Rotary Photographic Co and Marion and Co. In 1929 APeM became part of Ilford. When Harry Warren Wicks died in 1945, probate was given to his oldest son, Harry Raven Wicks, who was then a RAF Sergeant and photographer. References: Grace's Guide To British Industrial History, England census 1881, 1891, 1901, 1911. Family history information provided by Terry Raymond. Working Dates: 1866 - 1890? Subjects, styles, advertising, other relevant information: Samuel Page Widnall was born and spent his life in Grantchester. He was a nurseryman in 1851. From 1853 to 1894 he owned the Old Vicarage, Grantchester. By 1861 he was a farmer employing 7 men and 3 boys. In 1871 he was farming 78 acres with 5 men and 3 boys. By 1881 he was a retired farmer. Upon his retirement, in Grantchester, he set up a private press at his house, the Old Vicarage, Grantchester, which he called "The Widnall Press", where he printed a small number of books, among which was his own, "History of Grantchester in the County of Cambridge". Grantchester (1875). The poet Rupert Brooke once lived at The Old Vicarage at Grantchester, which is today the home of novelist Jeffrey Archer. From around the 1850s Samuel developed an interest in photography, which presumably was a secondary activity alongside his other work and interests. The carte de visite below is from The Simpson Family Archive and is believed to date from around 1866, although the bowler hats may point to a later date. 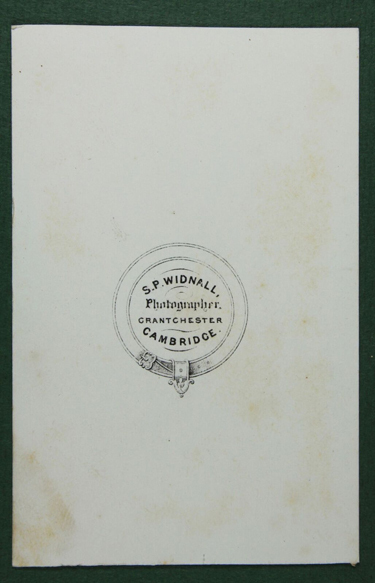 The mount has square corners and bears a garter design with the text "S.P.Widnall, photographer, Grantchester, Cambridge". References: The Cambridge Evening News 8 October 1982 carried an article about the chance discovery of a few of Widnall's glass negatives in Grantchester. Transactions of the Cambridge Bibliographical Society Vol 2 No 5 1958 p366-372 Samuel Page Widnall and his Press at Grantchester 1871-1892 by Bruce Dickins. Working Dates: This photographer is only known because of the survaval of one of his cabinet photographs shown below (author's collection). Henry Martin Wilkin was the youngest son of Martin Wilkin b: 1816 at Wilburton, a farmer at 100 ft Bank, Little Downham with 260 acres in 1881 and employing 6 men 1 boy and 2 women. Henry was shown as a farmers son in the 1881 census. Henry's father died in 1886. By 1891 Henry was still living at home, then in High Street Haddenham, his mother, Elizabeth b:1819 Haddenham, then being a widow. His occupation was shown as a farmer. In 1894 Henry married Emily Sutton b: 1866 Stretham and by 1901 Henry and Emily were living at Ivy House, Aldreth where Henry was shown as a farmer and an employer. In 1911 the couple were still living in Aldreth, Henry was still a farmer, but also an Officer of the Haddenham Level Commissioners. Subjects, styles, advertising, other relevant information: It would seem that photography was a secondary occupation for Henry Wilkin, farmer. From the address of Haddenham on the surviving photograph below he may have been practicing photography in the early 1890s. 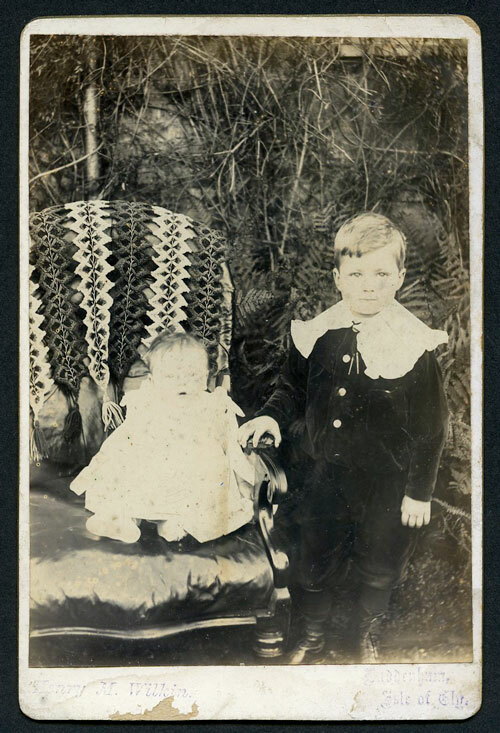 Below is a cabinet photograph of a young boy and a baby. 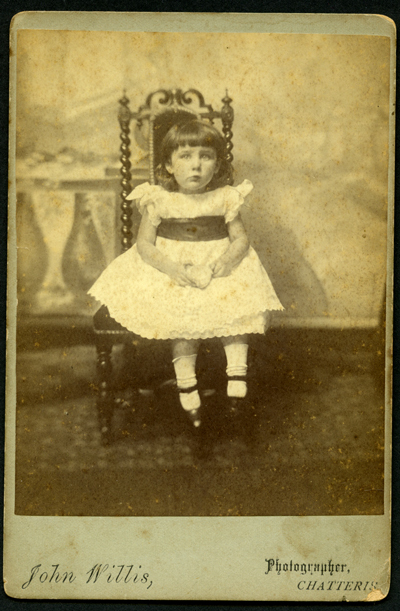 The photograph is taken outdoors with the baby seated on a chair. The mount is a white glossy card with gilt bevel edges and beneath the image is stamped by what appears to be two rubber stamps. "Henry M Wilkin" and "Haddenham Isle of Ely." The detail has been enhanced in photoshop in the second picture in order to make it readable. The reverse of the mount is blank. Subjects, styles, advertising, other relevant information: No directory entries found. A single carte de visite, probably from the 1880s, was offered for sale on the www.delcampe.net site from April 2015-Feb 2016. The reverse of the mount reads "Park Lodge Studio, Jeffrey Wilkins, Chatteris. This or any other likeness or picture copied and enlarged to any size. You can have more of these by sending the following number". Jeffrey Wilkins was the son of Joseph Wilkins, b.1829 Chesham Bucks, a baptist minister living in 1861 in Chatteris, and Esther Wilkins b.1832 Hatley St George, Cambs. He was the fourth of nine children in the family. It appears that Jeffrey's father's ministry took him to posts in Watford and Ipswich (birth places of his children). In 1871 the family, including Jeffrey, were living in Watford and Joseph was the baptist minister at Soho Chapel, 406 Oxford St London NW. Joseph Wilkins obviously had some ongoing connection with Chatteris as in 1879 he was in a dispute there with another Chatteris Photographer, William Cox, about parking a cart. Joseph Wilkins was then described as "late baptist minister at Chatteris Zion Baptist Chapel". In 1881 Jeffrey's parents and his siblings were all resident at Chapel House Wattisham, Suffolk. Jeffrey however was a boarder at 67 West Street, Bromley, Kent and was listed in the 1881 census as a photographer. (His details are incorrectly transcribed from the original as Jeffrey Welkins). He was boarding with an Irish jobbing gardener, David Wakefield, and his wife Rebecca. In 1891 Joseph was the baptist minister at Sherington, Buckinghamshire. No trace of Jeffrey can be found in the 1891 census. In 1901 Jeffrey was living in Derbyshire at 40 Market Street, Buxton, Derbyshire as a boarder. At the same address, his younger brother, Arthur John Wilkins, b:1869, Watford, was also boarding; both brothers were listed as photographers - workers employed by others. By 1911 Jeffrey had returned to London. He was living at 6 Limes Grove, Lewisham, Kent and was shown as a photographer and an employer. It appears that his brother, Arthur John Wilkins, practiced as a photographer at 65 St Johns Street, Bury St Edmunds in 1894-5. Jeffrey Wilkins is listed as a photographer in the Kelly's Suffolk Directory of 1908 at 4 Westgate Street, Ipswich. Subjects, styles, advertising, other relevant information: William was listed in the local directory as a Chemist and Druggist and Photographer in 1888. In 1891 the census return shows William at The Causeway Whittlesey as a chemist. His family at that time comprised: wife Sarah b:1863 Lowestoft, son Charles Halls b:1888 Whittlesey, daughter Alice Sarah b:1889 Whittlesey and son Ralph William b:1891 Whittlesey. William was a Chemist and Druggist and photographer and Depot for British and Foreign Bible Society in 1900. In 1901 William and his family were in Market Harborough where he was a chemist in the High Street. The family had grown with the additions of: son Frank H b:1895 Whittlesey and daughter Eleanor M b: 1898 Whittlesey. 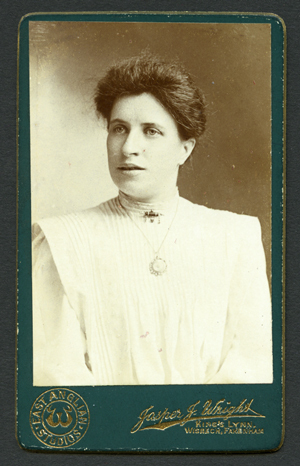 There is an example of his work on the Chatteris Community Archive site at: http://chatteris.ccan.co.uk/content/catalogue_item/rosa-peggs-daughter-of-daniel-sarah-ann-peggs-nee-bishop-a-chatteris-family. 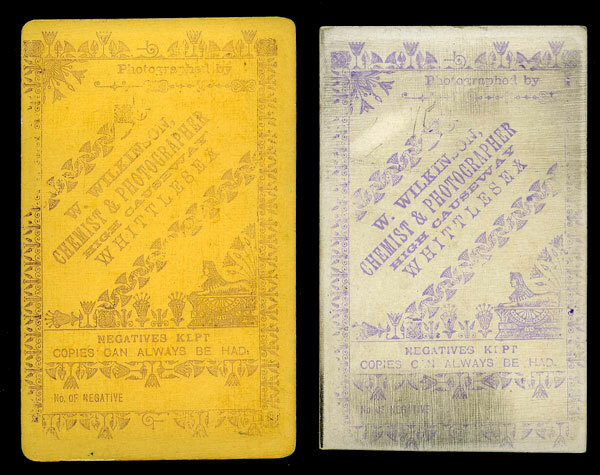 See below two cartes de visite by William Wilkinson (author's collection). 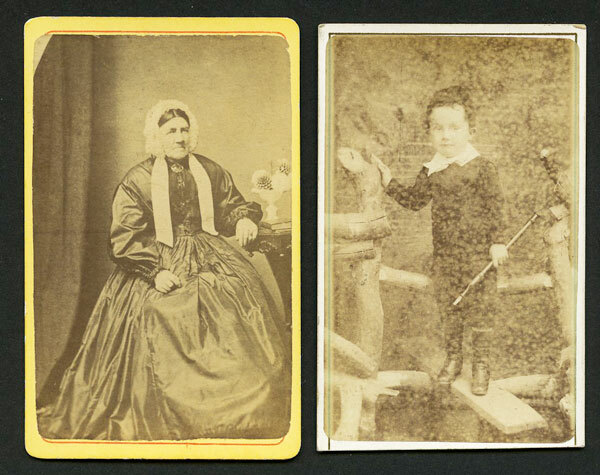 The dress of the subjects and settings suggest that the photograph of the lady is from the 1860s and of the child is from the 1870s. The photographs may therefore be copies of earlier images done in the 1880s/90s. The mounts are both backstamped with the same large rubber stamp. Subjects, styles, advertising, other relevant information: David Simkin, http://photohistory-sussex.co.uk spotted this self employed photographer in the 1911 Census returns. Not found in earlier census returns. References: No further information at this stage. Subjects, styles, advertising, other relevant information: Nothing known at present about this photographer other than the directory entries below. Subjects, styles, advertising, other relevant information: There is a 1901 school group photograph on the Cambridgeshire Community Archive Chatteris website by Ada Willis here: http://chatteris.ccan.co.uk/content/catalogue_item/new-road-boys-school-1901 Ada was the daughter of John Willis below. In the 1901 census Ada Louisa was listed as a photographic artist, working on her own account from the family home in the High Street at Chatteris. Also in 1901 she married Archie Robert Harrison Fenn (1875-1940) In 1911 the couple were living in Canterbury, Archie was an engineer and Ada had no occupation. Working Dates: c.1891 - 1911? Subjects, styles, advertising, other relevant information: We only know of the existence of this firm because of the survival of one of their cabinet photographs - shown below. 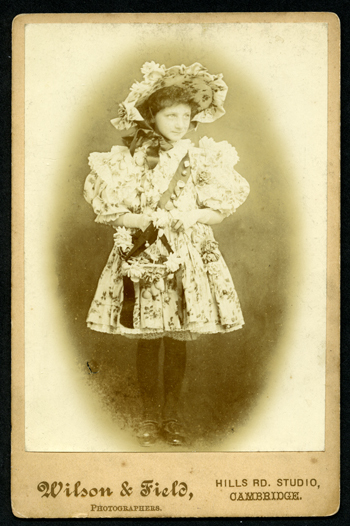 The photograph depicts a girl in her early teens in an elaborate dress with wide brimmed hat and carrying a lace decorated basket. Many shells are sewn onto the costume. This might be from a stage production, some sort of pageant or simply fancy dress. Overall this gives the appearance perhaps of a late 19th century piece. Beneath the image on the face is "Wilson & Field, Photographers, Hills Road Studio, Cambridge". 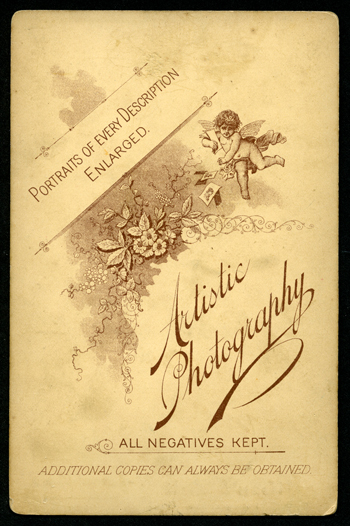 The reverse of the carte has no identification of the photographer referring instead to "Portraits of every description enlarged - artistic photography - all negatives kept - additional copies can always be obtained"
References: There is no trace of the firm in local trade directories. From the name and the address it seems likely that the Field part of the partnership was Ebenezer Field, a Chemist and Druggist who had his shop at 16 Hills Road, opposite St Paul's Church, later at 30 Hills Road - which might possibly have been the same premises re-numbered. There was an "E. Field" who was recorded as a local photographer involved in organising a photographic convention in Cambridge in 1902, Cambridge Independent Press 11/7/1902. There were two other addresses in Hills Road Cambridge used as photographic studios. In the late 1880s No 28 Hills Road was listed as an address used by the Cambridge photographer Valentine Blanchard. In the 1891 census No 38 Hills Road was noted as being used as a photographic studio - no residents were recorded. In the Kellys Directories of Cambridgeshire, 38 Hills Road was the studio of William Edelstein in 1891 and 1892. Subjects, styles, advertising, other relevant information: No trace found of this photographer to date other than the directory entry for 1922. Subjects, styles, advertising, other relevant information: In the 1891 Census Tom was listed as a photographer's apprentice living at Lucinda Terrace, New England, Peterborough with his widowed mother, dressmaker Mary A Wilson b: 1845 at Werrington Peterborough and his brother Arthur A Wilson b:1873 Peterborough, a painter's apprentice. The 1901 census shows Tom as an "artistic photographer" living with his widowed mother at 338 Lincoln Road Peterborough. In 1911 Tom was at 543 Lincoln Road, a photographer working on his own account living with his wife Georgina b:1872 Peterborough and son Kenneth Tom b: 1909 Peterborough. Local trade directories list Tom as a photographer working on his own account between 1903 and 1931. 1) Photograph (combination) of the interior of Saint Paul's Church, Peterborough, showing new Rood Screen and the Reverend A F Maskew in the top right hand corner (bust, nearly profile face). Copyright owner and author of work: Tom Smith Wilson, Lincoln Road Studio, 543 Lincoln Road, Peterborough. Date of agreement or assignment: 9th June 1908. Names of parties to agreement: Tom Smith Wilson and Arthur Fairclough Maskew. Form completed: 18 June 1908. TNA COPY 1/522/225. The first image below is a cabinet photograph of a middle aged cleric. The mount is on grey/green textured card with black printing "T.S.Wilson New England Peterborough" and a "W" monogram. The cleric depicted can be identified from other online images as being The Rev Arthur Fairclough Maskew, mentioned above. 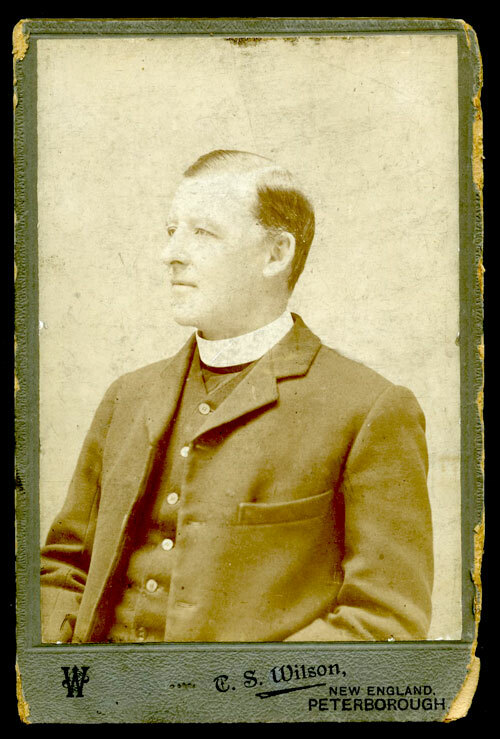 The New England address, and the apparent age of Rev Maskew, who was born in 1854, probably puts this photograph into the mid 1890s. The next example is a carte de visite from Simon Shirley's collection, is a vignette portrait of an unknown attractive young woman with pearl necklace, probable from around 1905/10, it is on a dark green enameled mount with gilt lettering on the face, "TS Wilson, Lincoln Road, Millfield, Peterborough". The reverse is blank. 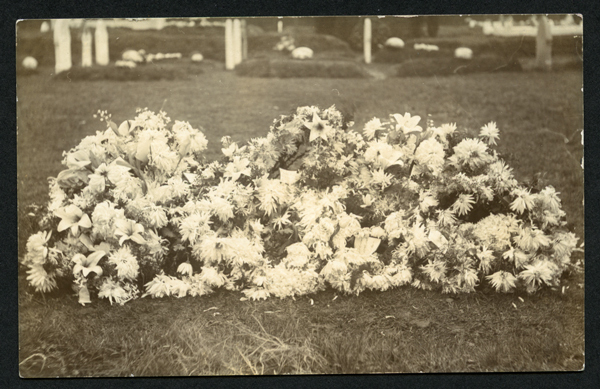 Below that is a photograph of floral tributes on a grave. The reverse of this is a postcard back with the name "T.S.Wilson, Lincoln Road, Peterborough" printed thereon. 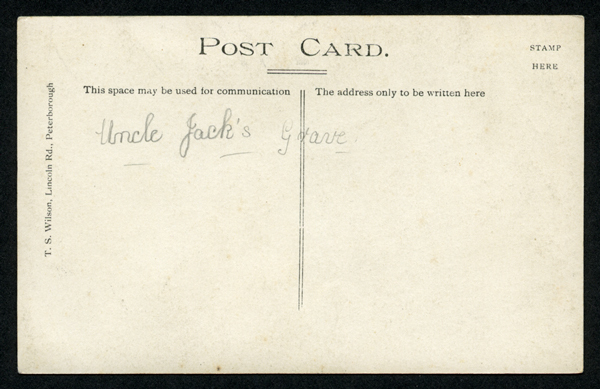 A previous owner has added to the reverse "Uncle Jack's Grave". Subjects, styles, advertising, other relevant information: An 1896 advertisement states “Established over half a century, photographer, grocer, draper, boot and shoe dealer and provision merchant” In 1881 William was living in Northampton with his wife Annie and working in the shoe making industry. In 1891 William was a photographer and Grocer in Chapel Street Duxford Cambs, living with his wife Annie b:1858 Derbyshire and his son Robert John b:1882 Northamptonshire. In 1901 William was living in Saffron Walden at 6 Gold Street. He was a photographer and an employer. 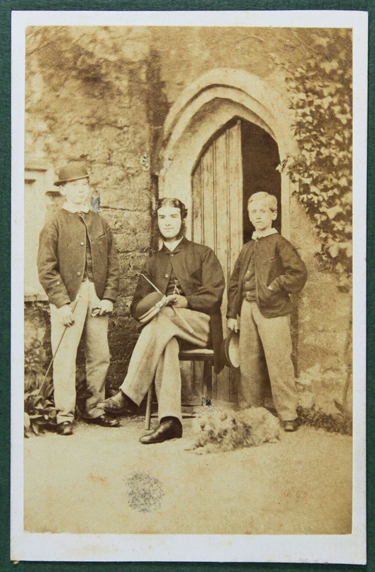 His son Robert John Wilson worked for him as a photographer. In 1911 he was living at 9 Birds Hill Letchwworth with his son and they were both listed as photographers. Subjects, styles, advertising, other relevant information: Ena was listed in the 1939 Register in her maiden name Lovely at the above address, occupation Photographer's assistant. She was living with her parents, Herbert J Lovely b: 5/8/1877, a wood machinist and Lily R Lovely b: 28/4/1880. In 1946 she married Charles G A Wisby at Peterborough. Subjects, styles, advertising, other relevant information: Little is known at this stage about this firm which had a 1937 directory entry. In "Lilian Ream A Life In Photography" by Kim Bowden, Cambs CC, 1992, p77, the chapter on Roland Ream, the son of Wisbech photographer Lilian Ream states, "At the end of the war Roland had returned full of ideas for expanding the business in the field of cine films. In 1946 the lease on the separate dress shop had expired and he took it over as an independent business called "Roland Ream Cine Service". He had always been interested in cine photography and was in the fortunate position of being able to build a business from his hobby. The shop sold cine cameras and projectors, sold, developed and printed films and carried out equipment repairs. Schools from a wide area became important customers for the sale and maintenance of visual aid equipment. Roland also hired commercially produced films and would show them to local groups and at private parties. He was assisted by John Day who had previously worked for E.Lawrence Witcombe Ltd, the portrait and commercial photographers at 7 Nene Quay who were also accredited dealers for Gebescape and Pathe cine apparatus. John Day, b:1913, appears in the 1939 Register, living at 164 Lynn Road, Wisbech, a photographic studio operator. E.Lawrence Witcombe appears to have operated as a photographer from Clarence Street, Kingston in the 1920s. On 1 September 1928 the Western Daily News p8 carried an article about a mystery handbag containing human bones being investigated by police. There was a photograph in the bag by EL Witcomb, who then helped the police by identifying the sitter. Subjects, styles, advertising, other relevant information: A number of advertisements in the local press in 1854 list the agents for the British Protector Mutual Life Assurance Co and show one of the local agents for March as "Worden, Photographic Artist" Nothing further known at this stage about this photographer. References: Cambridge Independent Press 22/4/1854, 27/5/1854, 10/6/1854, 17/6/1854, 24/6/1854, 8/7/1854 and 15/7/1854. Subjects, styles, advertising, other relevant information: one photograph from c.1880 of handbell ringers at Elm church, see ref below. Subjects, styles, advertising, other relevant information: In 1891 Jasper was a photographer and an employer living and working at 125 London Road, Kings Lynn. In 1901 Jasper was living with his large family at 125 and 126 London Road Kings Lynn. He was a photographer and an employer. In 1911 Jasper and his family were at "East Anglia", West Winch Rd, Kings Lynn. He was a photographer and other members of his family working in the business were: wife Emma b:1859 Norfolk; sons Robert William Handel Wright b:1889 Kings Lynn, George b:1895 Kings Lynn; daughter Eliza b:1893 Kings Lynn. 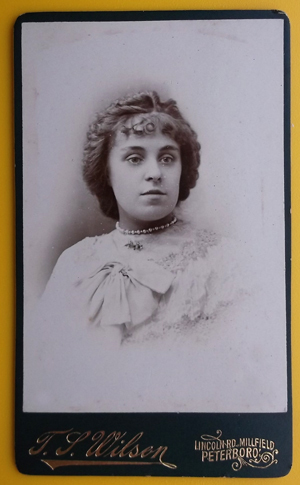 The carte de visite below (author's collection) of an unknown lady is mounted on green card with gilt edges and lettering "East Anglian Studios, Jasper J Wright, Kings Lynn, Wisbech, Fakenham." The reverse is blank. The Wisbech and Fakenham Studios were presumably branches opened by the firm at different stages in its growth. Jasper Wright's Wisbech business was bought up by Lilian Ream.